Ed Glover,(center) a volunteer caretaker of the University of Wisconsin Allen Centennial Garden points out how photogenic Joseph Tychonievich is (but we already knew that!). 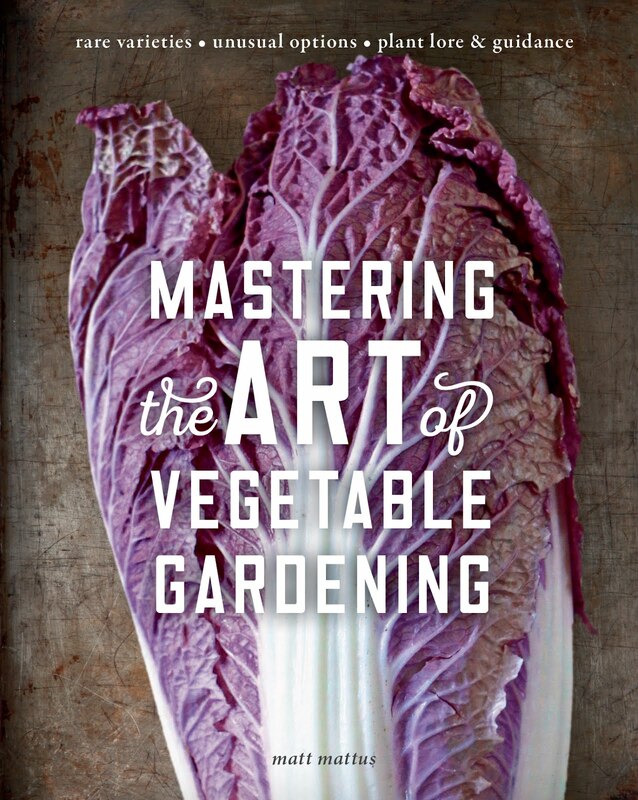 Joseph is author of the hit book - 'Rock Gardening - Reimagining a Classic Style' (2017 Timber Press). 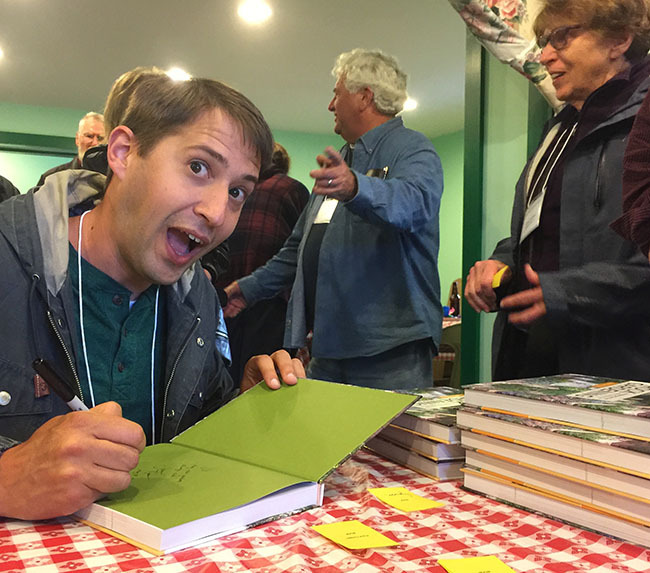 Jospeh delighted members of the North American Rock Gardening Society (NARGS) at the 2017 NARGS Spring Fling Study Weekend, hosted by the Wisconsin-Illinois chapter of NARGS held in Madison Wisconsin. 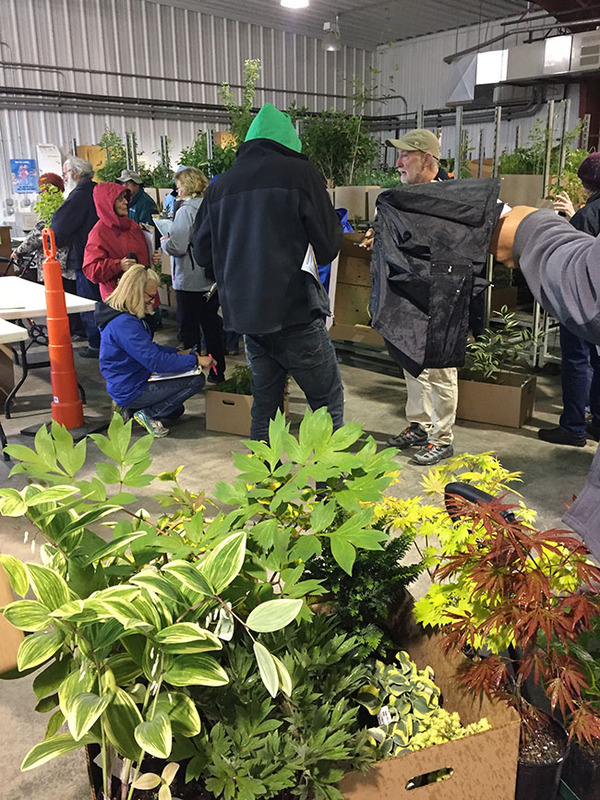 This past weekend I journeyed out to Madison Wisconsin to attend the 2017 NARGS spring study weekend hosted by the Wisconsin - Illinois chapter of the North American Rock Gardening Society. A bitter sweet event as this was the last event I am attending as president of the parent organization of NARGS, but I will remain active in many ways, as both a board member and driving some special projects coming up and yet to be announced. 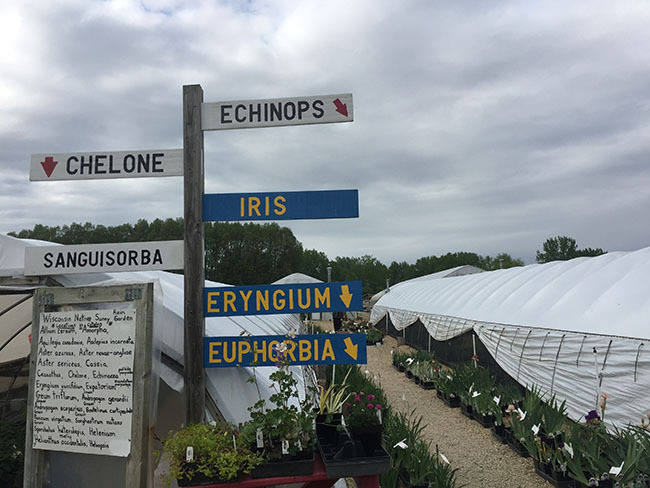 NARGS members load up on rare and unusual plants at Klehm's Song Sparrow Farm and Nursery, just one of the nurseries we stopped at in the Madison, WI area. At this event, which marks the return of the popular 'Study Weekends' all credit goes to the amazing team at the Wisconsin-Illinois chapter. A flawless event, as these things which are often more about moving people and feeding them as much as they are about finding great gardens to tour and finding inspirational speakers, much can go wrong if every detail isn't tended to, but like a well-planned wedding, this event was a terrific experience for all who attended, and everyone knew that it was the weather, which could not be controlled. Rock gardeners are hearty folk, so all (but me) came well prepared with rain and snow gear, mud boots and a cheery disposition. I loved watching members take notes and snap photos in the pouring rain. As these signs at The Flower Factory indicate, NARGS is perhaps the geekiest of the plant societies, as it attracts some of the most accomplished gardeners - those into all sorts of plants - NEWS FLASH - NARGS, may attract rock gardeners, but the organization attracts those into all sorts of plants including woodland plants, ephemerals, bulbs, rare perennials, shrubs, trees, ferns, cacti and succulents and much more. If you live in the North East, you know well the unseasonably cold and wet weather we are getting, and in Madison, it was perhaps even colder and wetter - but the rain and chilly wind did nothing to dampen spirits with this most-spirited of groups. 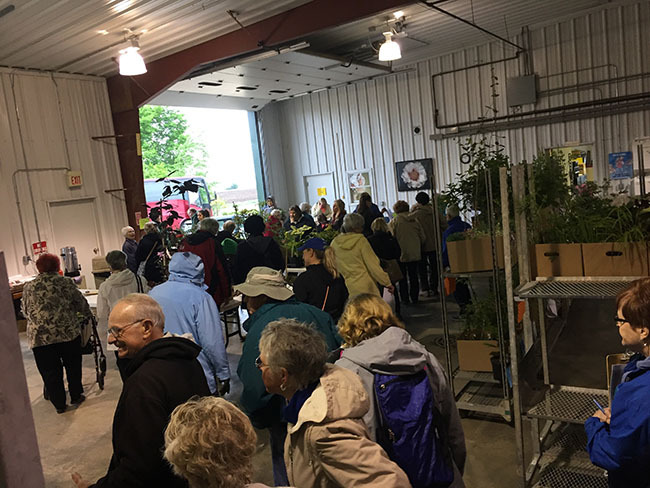 As events kicked-off on Friday night with a bus trip out the The Flower Factory - the mid-wests largest perennial nursery located near Madison, along with a fabulous pig roast they hosted in one of their barns, the weather was last on everyones mind. 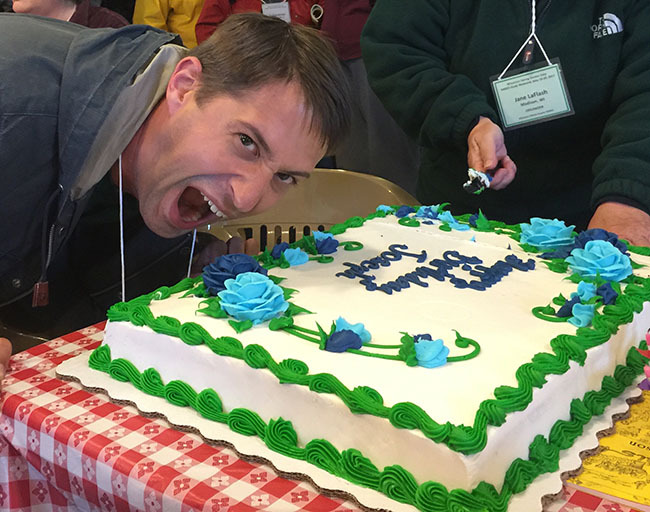 The Madison NARGS chapter surprised us all with a cake to celebrate Joseph's birthday, which was a day earlier. Now that I think about it, Joseph may be the organization's youngest editor. 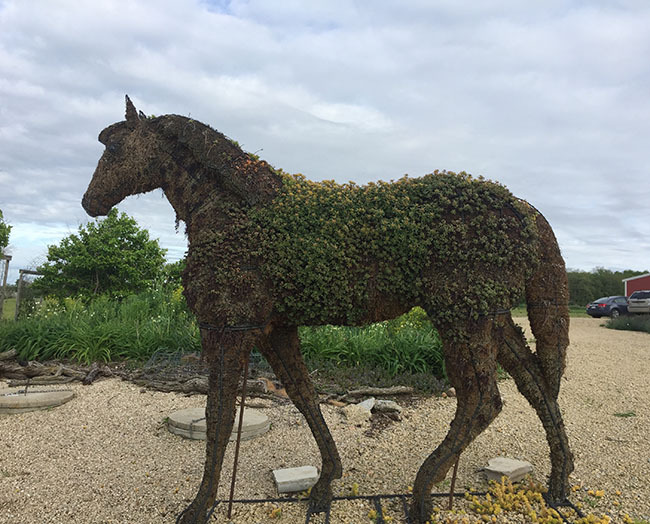 The Flower Factory had some fun and clever pieces of art - these life-sized horses covered in succulents were very popular. Klehm's Song Sparrow Nursery was crowded, even with the rain when we arrived. 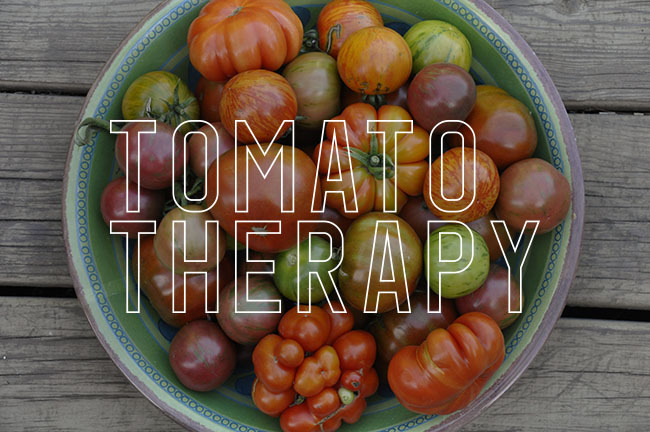 Located in idyllic farm country somewhere outside of Madison where the land is flat, the soil rich and dark and where ever barn looked like a Fisher Price farm set. 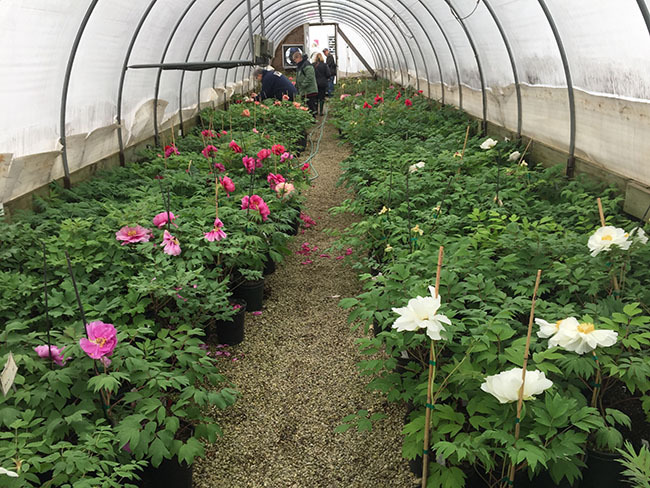 Their hoop houses each contained treasures - one filled just with lilacs, another, just tree peonies, another one just filled with magnolias - I could have spent days shopping if I had brought a truck. 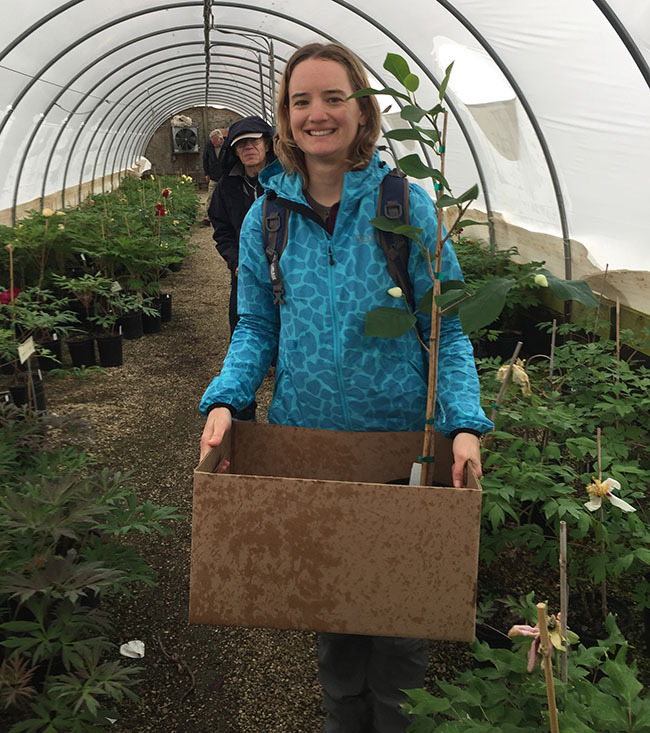 Mariel Tribby from the Gateway chapter of NARGS (St. Louis, MO) enjoys out first stop of the day at Klehm's Song Sparrow Farm and Nursery, (a long time favorite nursery of mine, as you may know. ), so it was difficult for me not to buy any plants. I flew here to Madison and just didn't have room to sneak back a single plant. Really. 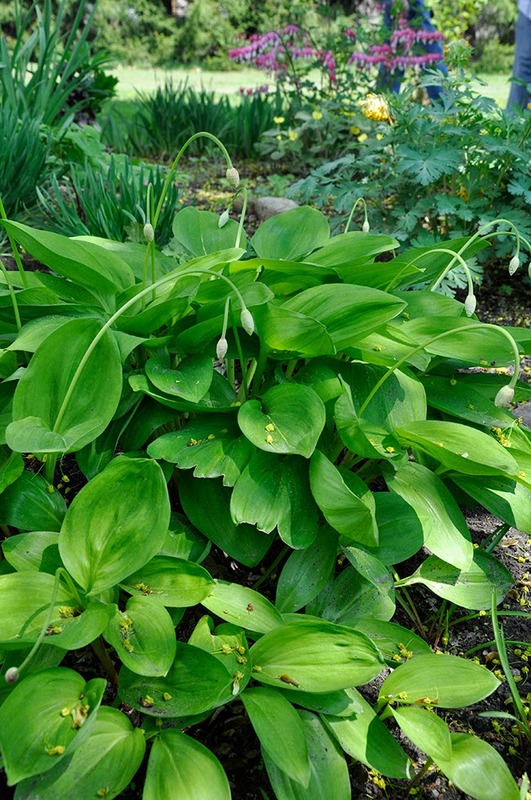 ...or this for certain, Polygonatum 'Double Stuff'. I am ordering this right now, before you all do. It was so striking in real life. 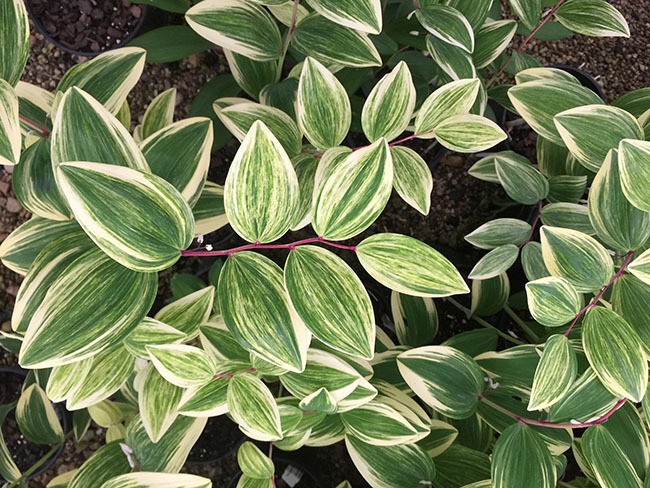 Hosta are tempting me.....I think in photos they look ordinary, but believe me, in person, they make deciding on which one to take home very difficult. 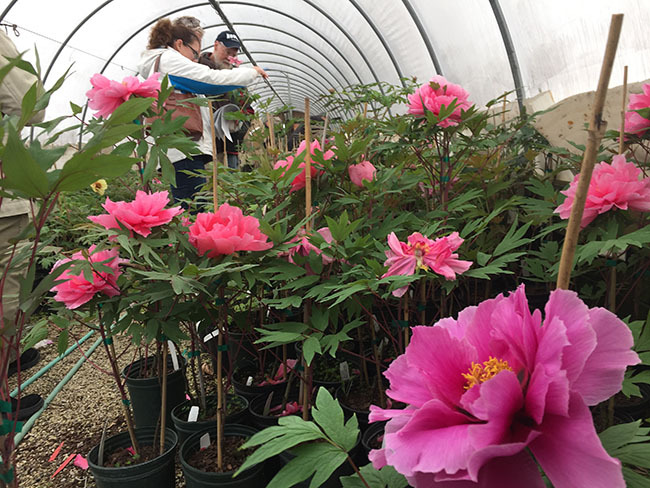 Then of course, Klehm's Song Sparrow Nursery is all about peonies - which after 4 generations of breeding them, they are one of the worlds premier sources. Just check out the foliage on these. 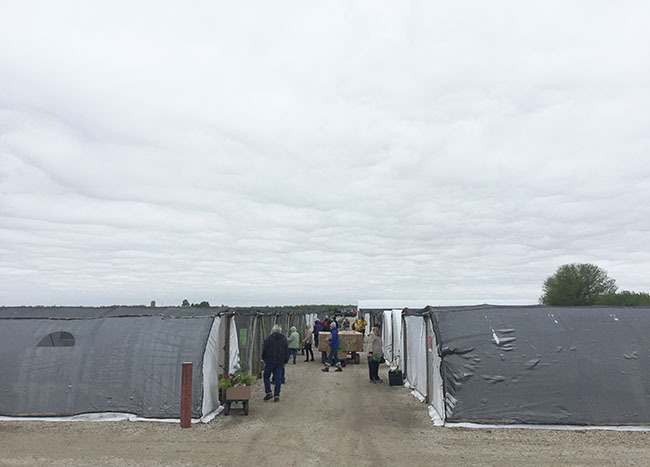 Most of the plants at Klehm's Song Sparrow Farm and Nursery were kept in hoop houses, of which we were very thankful of - as it was raining - no, pouring, and very, very cold. 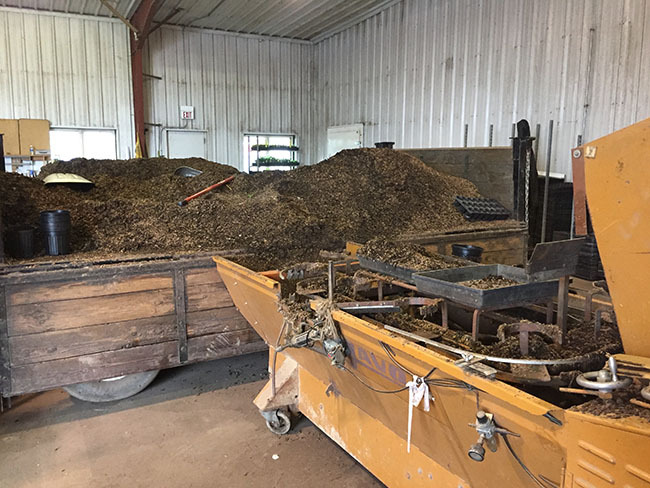 I enjoyed seeing the behind-the-scenes at Klehm's Song Sparrow Farm and Nursery, this machine mixes compost and potting soils to create their own blends. 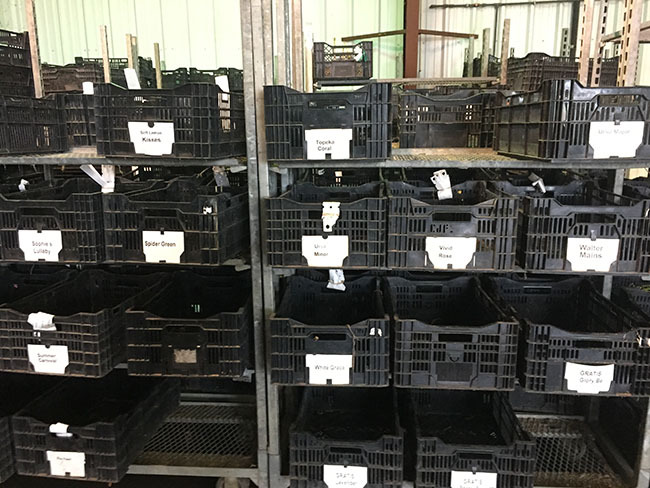 These bulb crates were used for sorting our peony roots. Look who I found in one of the barns - Panayoti Kelaidis from Denver Botanic Gardens! 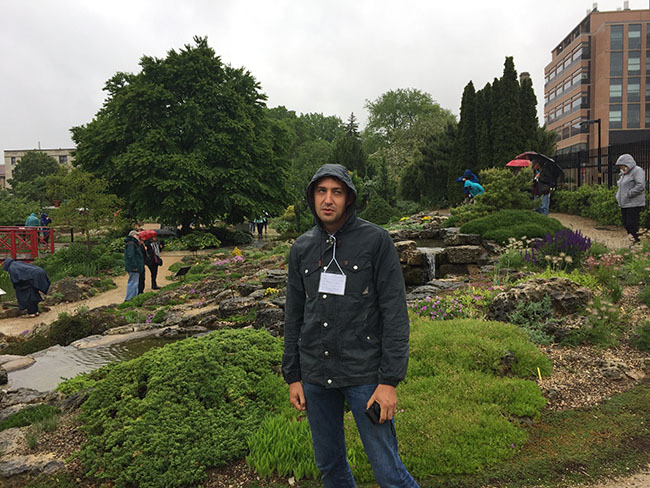 (Well, OK, he is the a board member of NARGS so he was already here, but sometimes I think that there are clones of Panayoti's around - I mean, he was just in the Czech Republic earlier in the week speaking at a rock gardening conference! 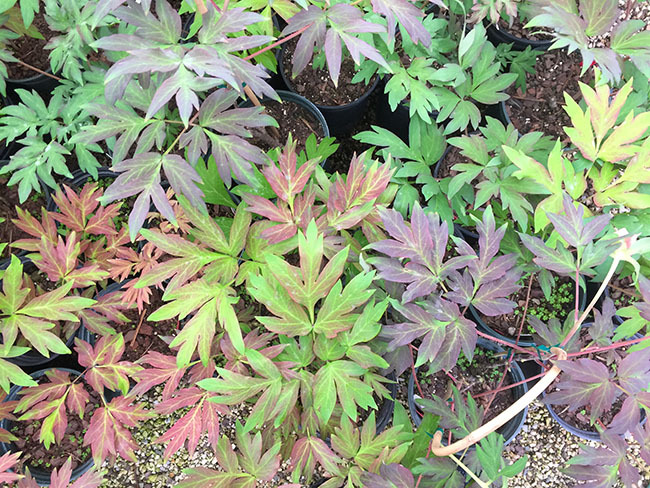 The peony greenhouses were popular with the groups visiting. I even bumped into a blog fanboy from Seattle! It's probably a good thing that I don't live closer to Klehm's Song Sparrow Nursery, but, they do have a great mail order site! 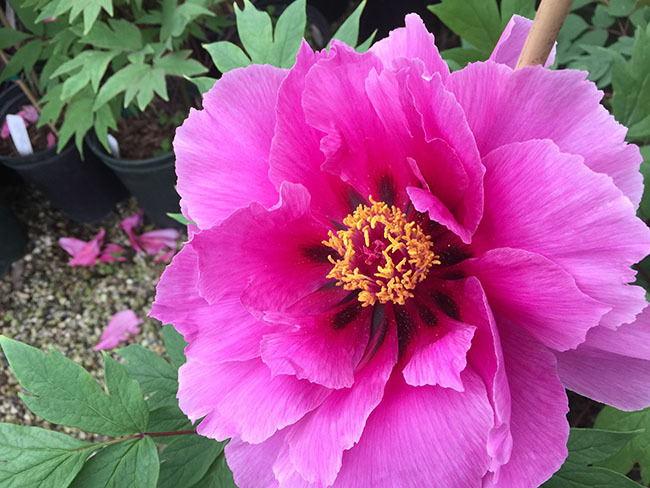 I didn't get the name of this tree peony, but I suppose that it really doesn't matter - who could say no to this? 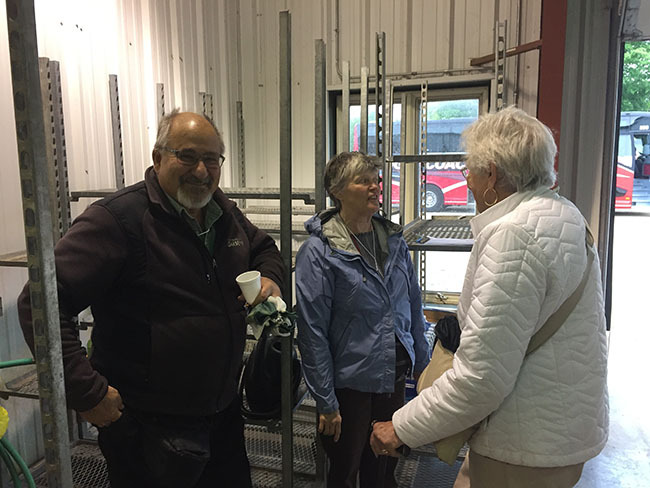 NARGS members and a few other plant societies who were visiting on this 'open day', as Klehm's is not open to the public formed long, long lines at the check-out table. Even Roy Klehm himself helped check people out. While waiting for members to check out their plants, I snooped around the offices. 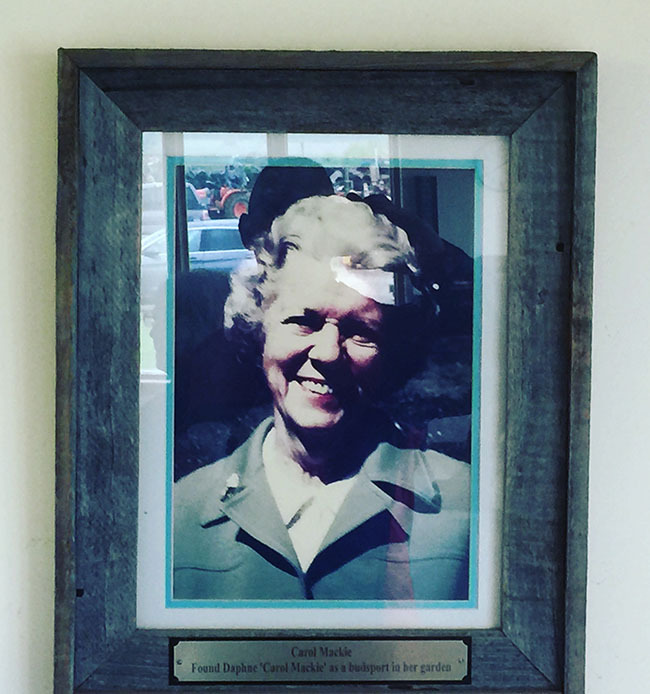 Look at what I found - a photo of the real Carol Mackie, founder of the famous Daphne 'Carol Mackie' which was growing as a sport in her garden. 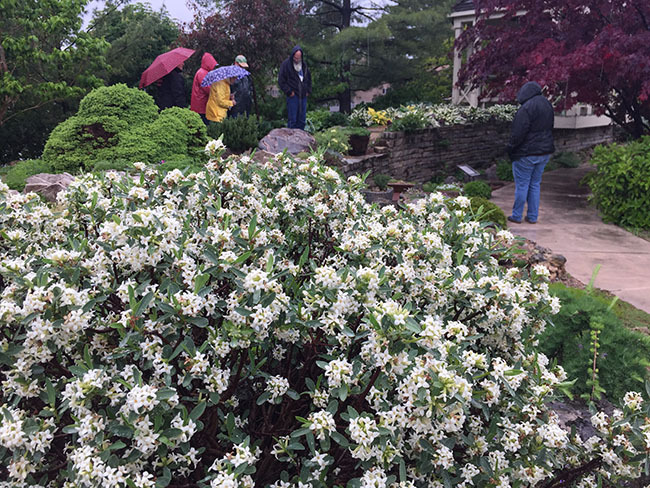 Garden tours filled in the rest of the day, and although gloomy and wet, attendees were delighted with both the tours and the plants. 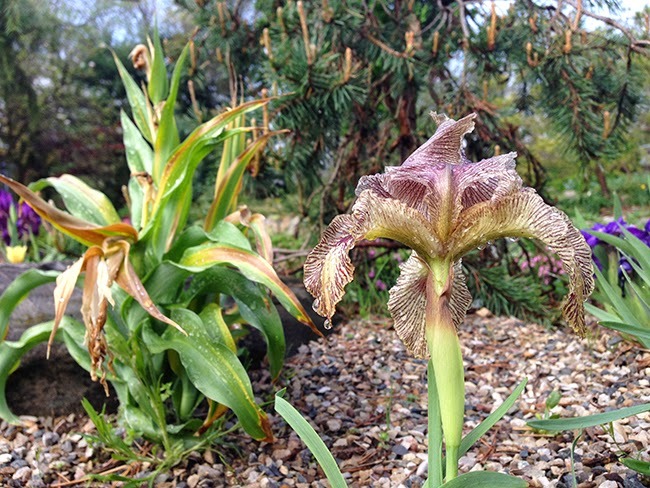 This Regeliocyclus Iris Dardanus was a hit at one private garden - surely, this is what one wants blooming on that day - rain or shine, when you have a garden tour coming over. 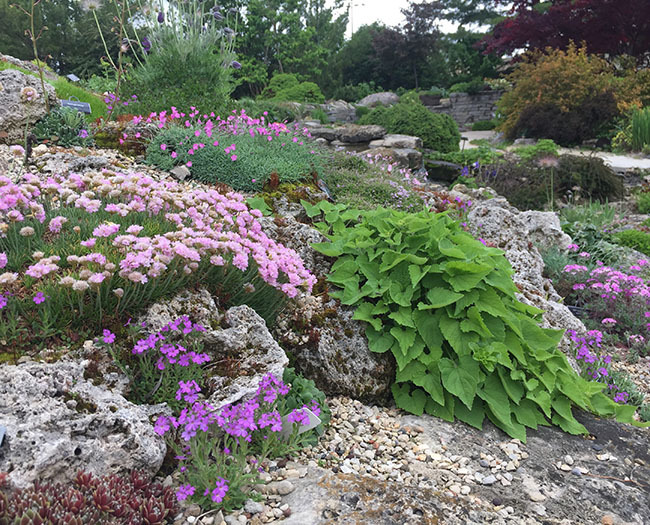 Woodland plant combined with perennials and massive boulders all looked very natural, as if they had been growing there for eons, but the garden was only 3 years old. Imagine setting in boulders like this? 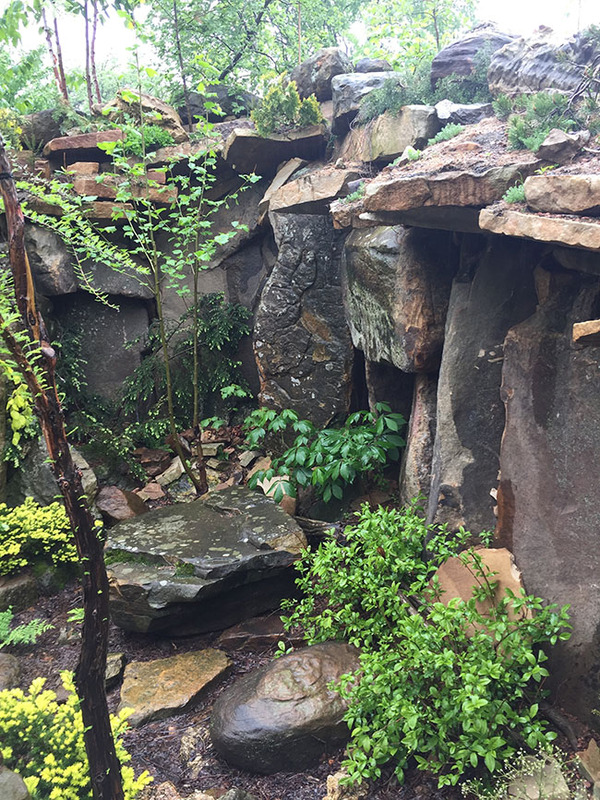 Hundreds of tons of stone were brought into this small 1/4 acre plot in a typical neighborhood, but with rainwater catch basins and native plants combined with woodland plants from all over the world, one can feel as if one escaped the city very easily. I was so impressed. Another private garden also featured no lawn, but every inch was planted with perennials and interesting woodland plants. 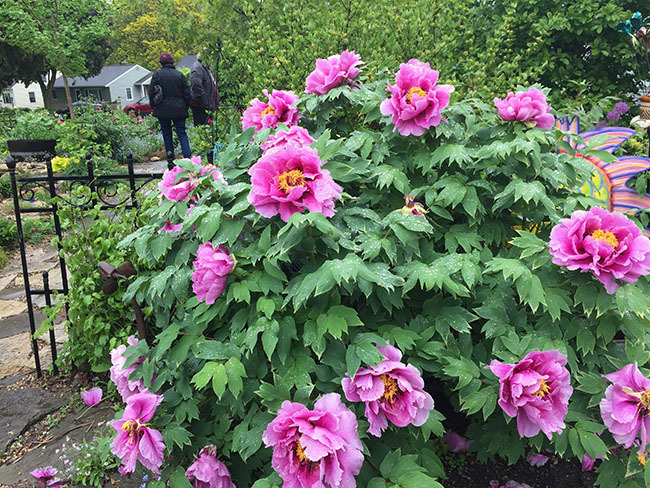 This tree peony was a show stopper. and it grew right next to the driveway! The next stop brought out two busses to the campus of the University of Wisconsin - Madison (Go Badgers! 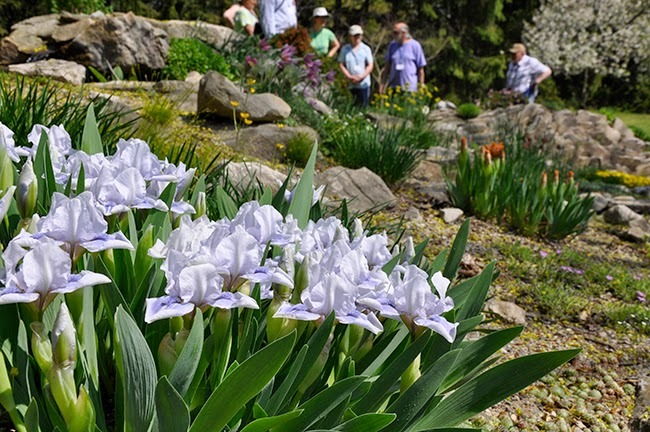 ), where we were thrilled with one of the finest alpine gardens I have ever seen at the Allen Centennial Garden, a teaching garden that surrounds a historic Victorian home that once served as a residence for university deans. Ed Glover is the man responsible for the rock garden's success, (believe me, EVERYONE has told me that Ed is the rock star here, for few wanted to take credit!) but I know there were many volunteers and staff who contribute time and scuffed knees as well. The University garden is maintained by volunteers from the Madison chapter of NARGS who call themselves the Rock Heads (or Rockets, or Rockets - I really couldn't understand the man on the microphone, but all are appropriate names!). Tons of Tufa rock and impeccable specimens were everywhere - I only had my iPhone, and I ran out of memory. 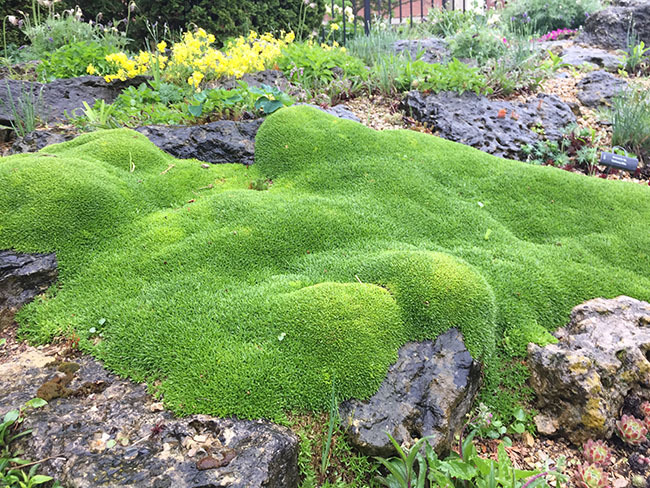 True alpine plants are often buns or densely growing mounds which from to be able to survive the high levels of ultraviolet light found at high altitude, and of course, the glacial conditions. This specimen of an Arenaria sp. 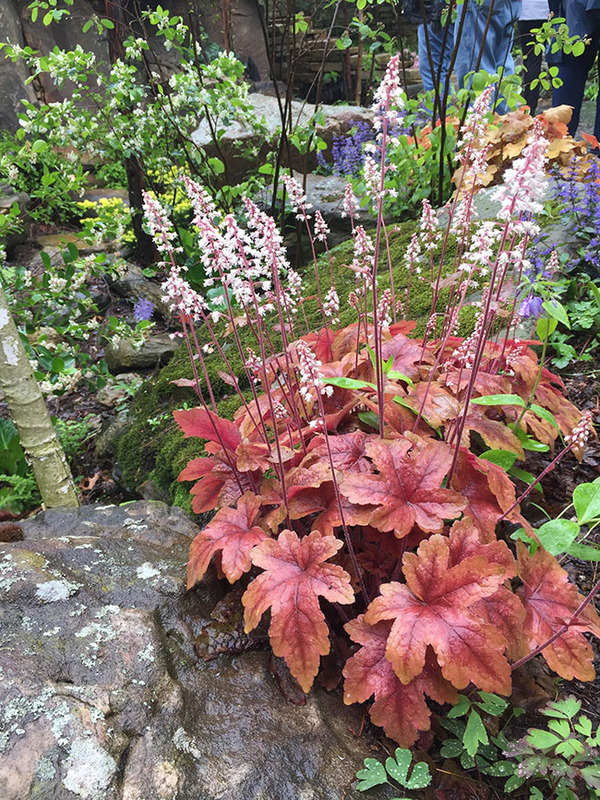 shows how spectacular an alpine plant can look Not easy to grow well, this one made everyone kneel down, even in the pouring rain! We were fortunate to hit this garden at peak bloom, just as the saxifrages, dianthus and Daphnes were putting on their best show. 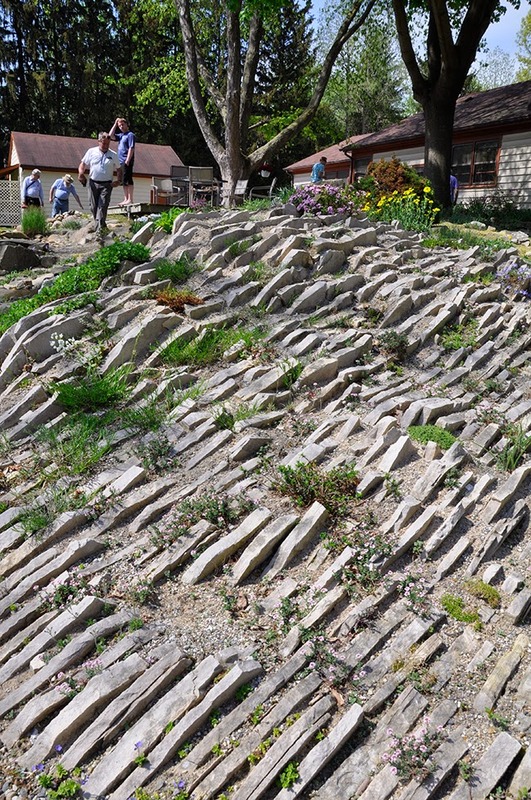 These alpine gardens look difficult, but in fact, they are easier to maintain and water-wise. 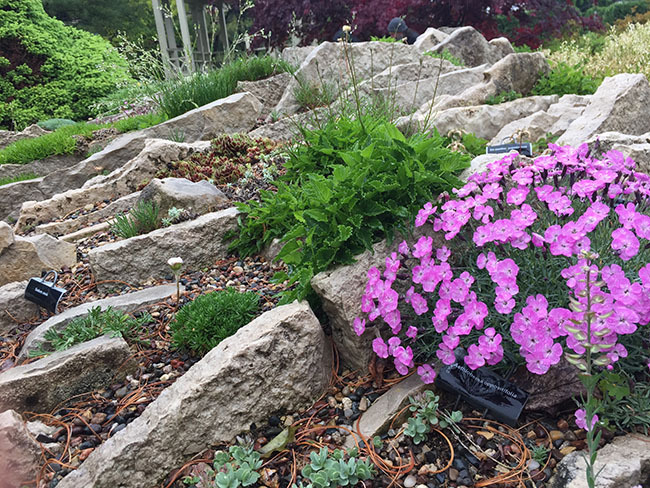 Forming berms with a trim blend soil mix of 1/3 loam or compost, 1/3 gravel and 1/3 sand, many alpines can grow. 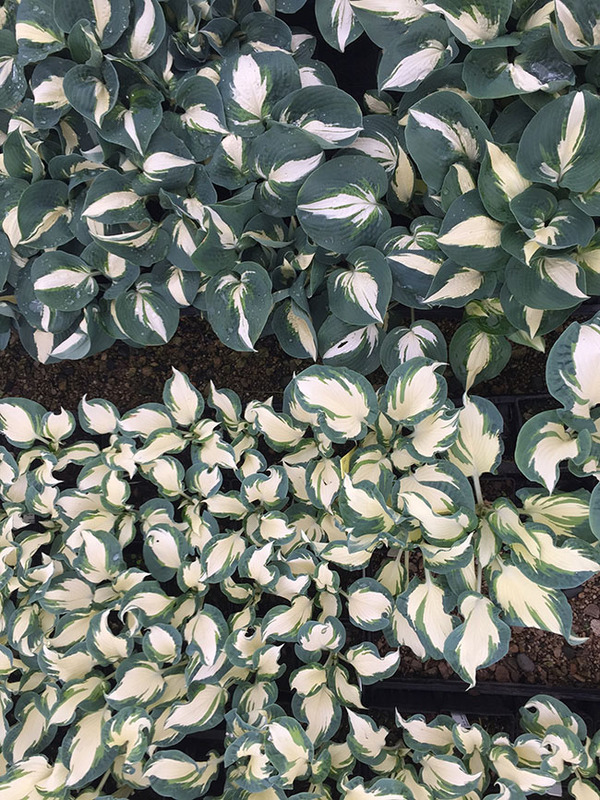 Fast draining, which is what they like, you'd be surprised as how easy many of these high elevation plants, which all tend to be small, will grow. Mulch with rocks and gravel, and you can kiss that lawn mower goodby! Daphne shrubs like this D. alpina do best in rock gardens, but they are rarely seen in nurseries since they dislike being in pots, and are challenging to propagate. 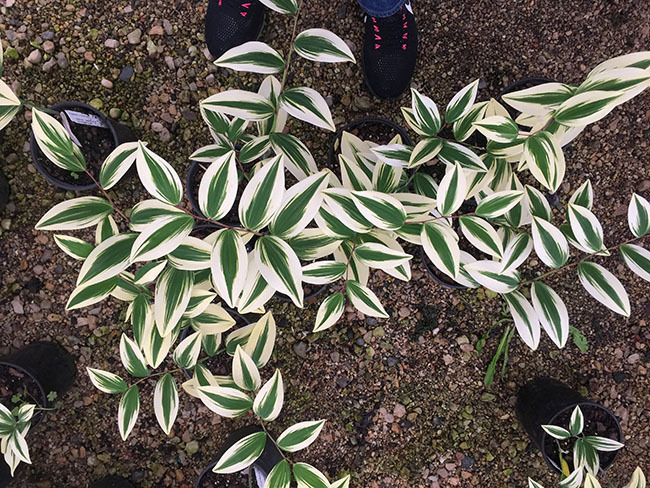 Look for small 2" rooted cuttings at specialty plant sales (like NARGS sales at your local chapter) for this is often the only way you can get these plants. Easy if planted once, while tiny and never, ever moved. I have some that have been in bloom every day of the year. Ignore this cheerful photo of Joseph Tychonievich, and look at that Daphne shrub just to his left, and the one under the red umbrella on the right near the rocks. 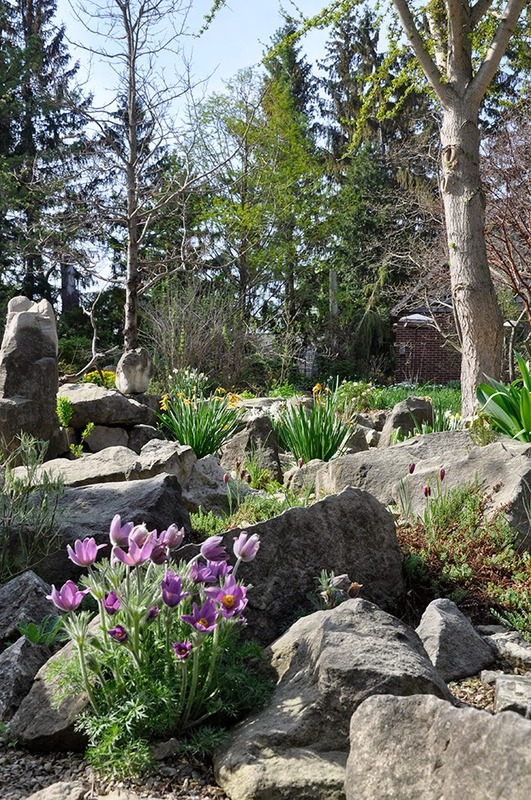 Most rock garden Daphne form mounded, evergreen rock-shaped forms which bloom in a big way in spring with pink and purple fragrant flowers, and then often re bloom through the summer, here and there. 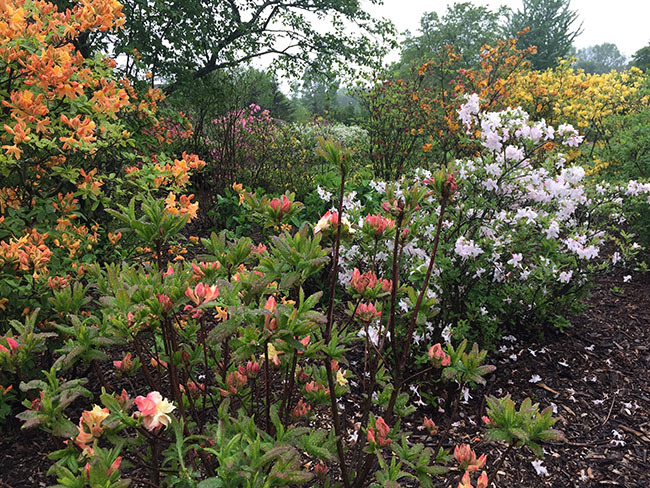 Our last stop was at the University of Wisconin-Madison Arboretum where I ran out of memory on my phone, but I was able to get one good shot of an azalea collection. 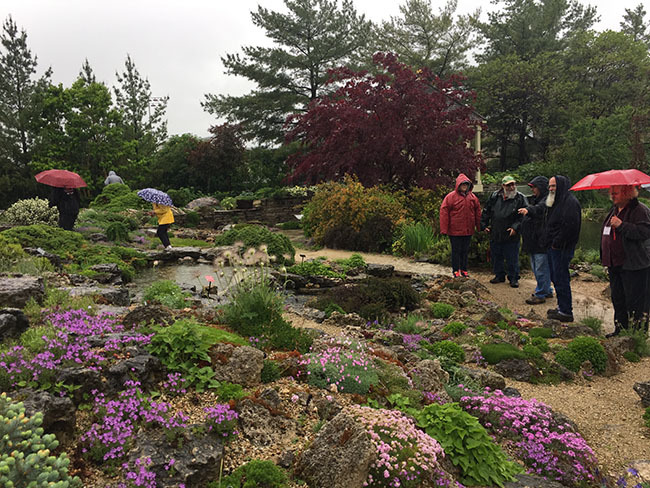 I am still recovering from last weeks jam-packed trip out to Michigan where the North American Rock Garden Society held its annual meeting, hosted by the Great Lakes chapter. I've been to about 7 of these annual meetings and study weekends, and I can confidently say that this one succeeded spectacularly. As the current president of NARGS, I could easily be a little opinionated, but it would be no exaggeration to say that this particular event was flawless - perfect spring weather which encouraged some of the finest alpines and woodland plants into peak bloom just in time for a couple of hundred plant geeks, and I really don't need to say that after the winter we all survived, was nothing more than a miracle in itself! THE ROCK WORK IN JACQUES GARDEN WAS INSPIRATIONAL - SO NATURAL AND COMPLEMENTARY TO THE INTERESTING PLANT MATERIAL. A MOUNTAIN MEADOW AT LAKE-LEVEL! Being my first trip to Michigan, I was looking forward to driving out from New England, even though the drive would take two days and take me through much of Ontario, Canada. I felt that I needed the time to get my thoughts together for the board meeting which preceded the event, and to relax a bit ( yes, sometimes, driving can relax me, although it took the rental of a big, new Dodge Ram pick-up and a few hundred miles of white Trillium grandiflorum, the grandeur of Niagra Falls and the magnificent spring woodlands and fruit orchards of the Great Lakes region. I should mention that this event coincided with the spring migration of warblers and songbirds - the East Coast deciduous forest was alive and singing in so many ways - why would I ever want to fly in a cramped plane? 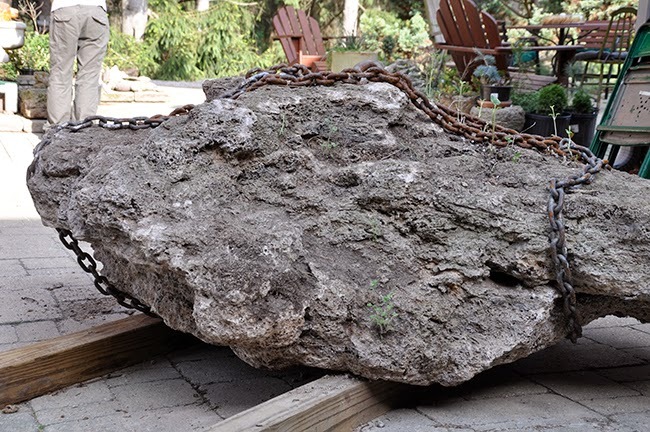 TUFA ROCK IS A LIMESTONE ROCK CHERISHED BY ROCK AND ALPINE GARDENERS, AND THIS PART OF THE COUNTRY HAS SOME OF THE FINEST PIECES AVAILABLE. WE ALL ADMIRED THIS ONE - SINCE A PIECE THE SIZE OF A LOAF OF BREAD SELLS FOR ABOUT $25. THIS BEAST WAS AWESOME! MY GUESS IS THAT THIS CLUMP WAS OF POLYGONATUM KINGIANUM, A RARE CHINESE POLYGONATUM WHICH HAS ORANGE BLOSSOMS AND TALL, 6 FOOT STEMS OR MORE. 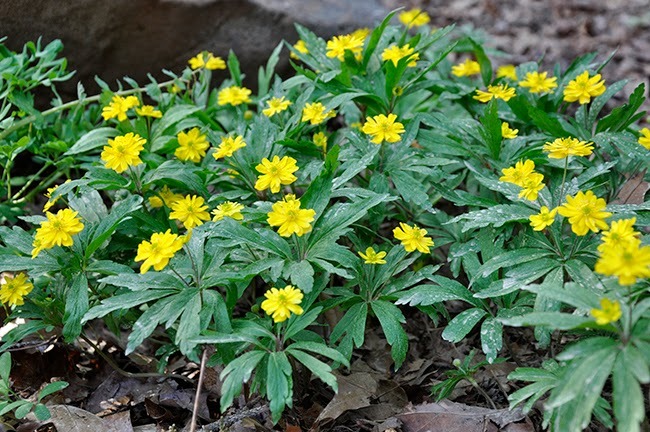 THE YELLOW FLOWER IS THE SINGLE FORM OF ANEMONE RANUNCULOIDES. 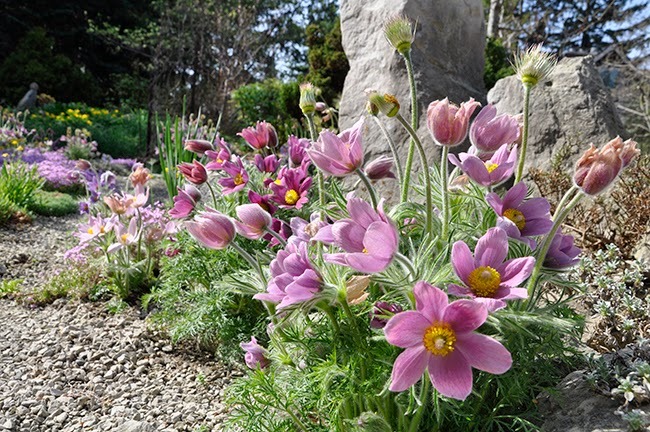 ANEMONE RANUNCULOIDES AS A DOUBLE FORM - IF ONLY MINE GREW AS NICELY AS THIS! A SPREADING WOODLANDER, THIS DOUBLE FORM MADE IT ONTO MY EVER-GROWING WISH LIST. 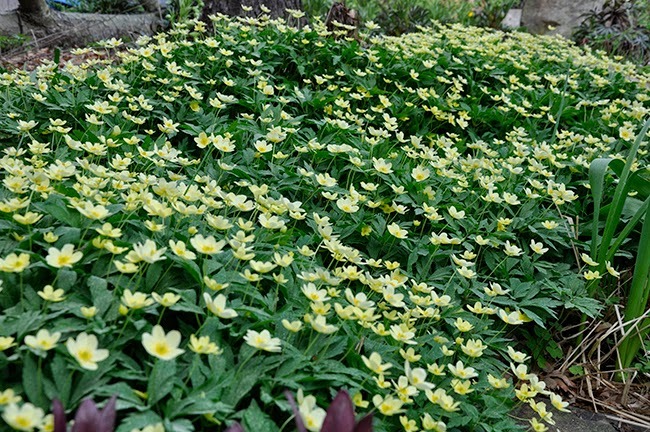 WE SWOONED OVER THIS MASSIVE COLONY OF ANEMONE X. LIPSIENSIS 'PALIDA' , A CROSS BETWEEN A. RANUNCULOIDES AND A. NEMEROSA WHICH NOW OFFICIALLY TOPS MY MUST-GET LIST OF EARLY SPRING BULBS! 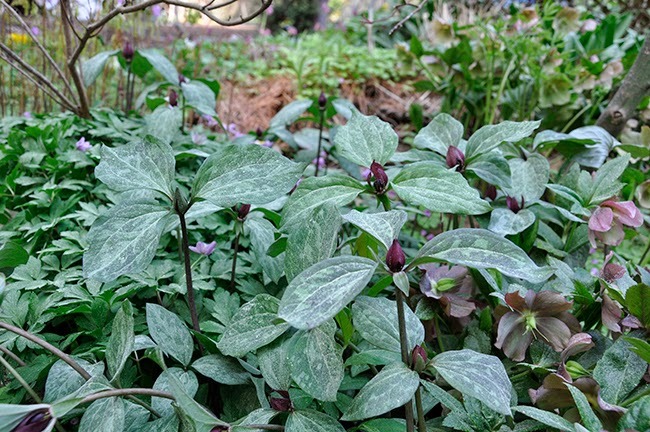 I HATE TO ADMIT THAT MY TRILLIUM ID IS WEAK - BUT THIS BEAUTY(MAYBE TRILLIUM CHLOROPETALUM - BUT PLEASE FEEL FREE TO CORRECT ME) INSPIRED ME TO BUY MANY SPECIES WHILE VISITING LOCAL NURSERIES IN THE AREA. ONE CAN NEVER HAVE TOO MANY TRILLIUM. 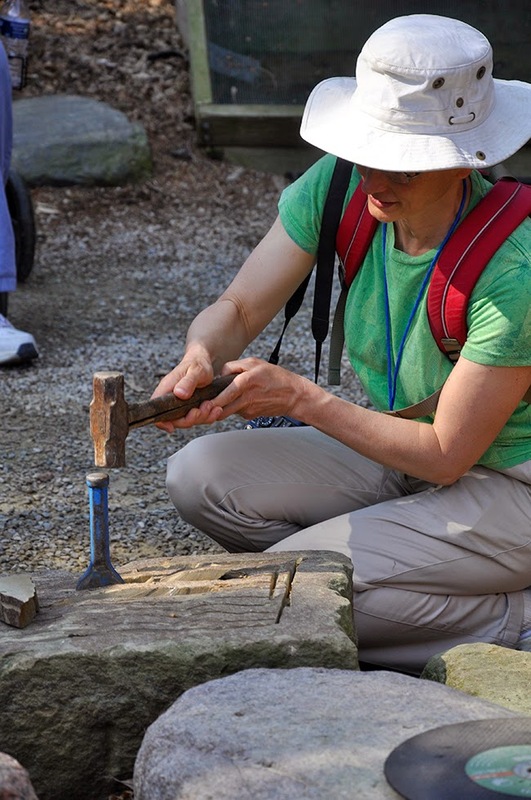 JANET LEARNS HOW TO SPLIT ROCK AND MAKE A STONE TROUGH AT A WORKSHOP THAT JACQUES HELD FOR NARGS MEMBERS. 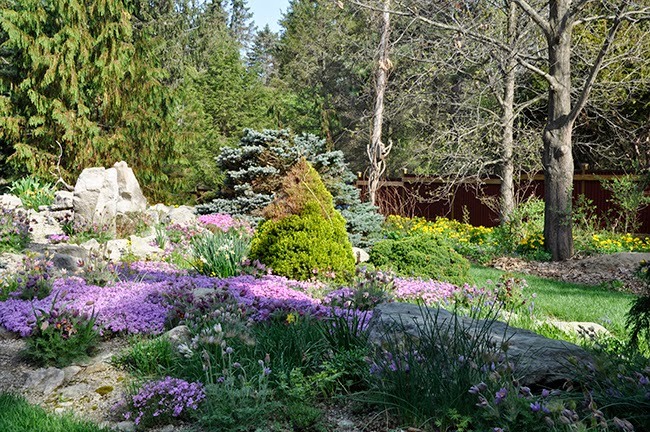 JACQUES BEDS FROM A DISTANCE COMBINE TREES, DWARF SHRUBS, WOODLANDERS, PERENNIALS AND ALPINES ALONG WITH GRAVEL MULCH - THIS IS ONE LOOK I AM GOING TO COPY. I NEVER CAPTURED THE NAME OF THIS BEARDED IRIS, BUT WHO CARES, IT'S JUST AS NICE WITHOUT LABEL. 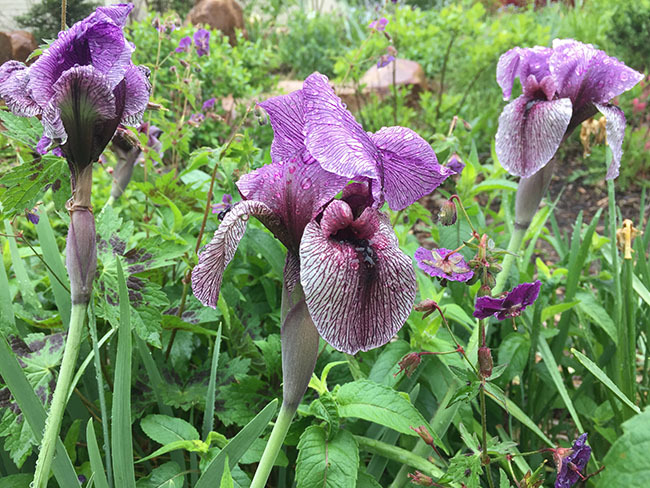 I NEVER IDENTIFIED THIS ARIL IRIS IN THE GARDEN OF DON AND MARY LAFOND, BUT MY GUESS IS THAT IT MIGHT BE IRIS ARILBRED 'OYEZ'. WHO CARES, IT'S GORGEOUS. 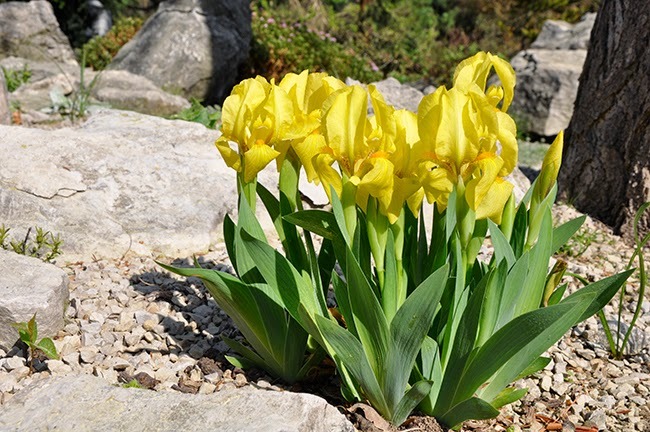 IRIS ARE NOTORIUS FOR BEING SHY WHEN A GARDEN TOUR IS SCHEDULED A YEAR IN ADVANCE, BUT THIS PAST WEEKEND PROVED THAT TIMING SOMETIMES ACTUALLY PLAYS OUT. 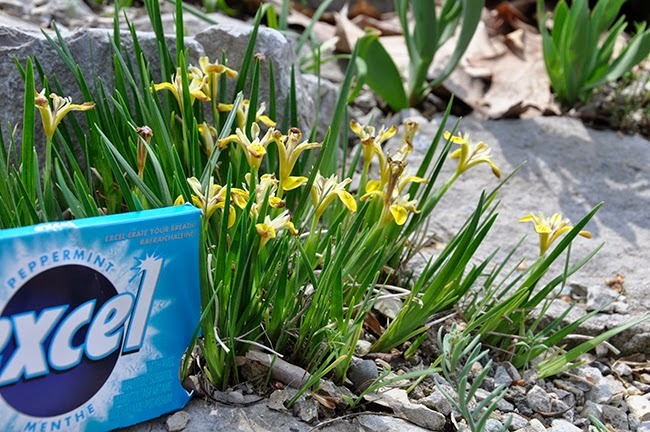 THE MANY IRIS WE SAW WERE IN PEAK BLOOM. THIS TINY IRIS WAS INDEED, TINY. NAME ANYONE??? I KNOW I PUT IT IN MY IPHONE, BUT NOW I CANNOT FIND IT. ALLIUM VICTORIALIS VAR. PLATYPHYLLUM, THE VICTORY ONION MADE IT INTO MANY OF OUR NOTEBOOKS AS ONE PLANT TO TRACK DOWN FOR OUR OWN GARDENS. 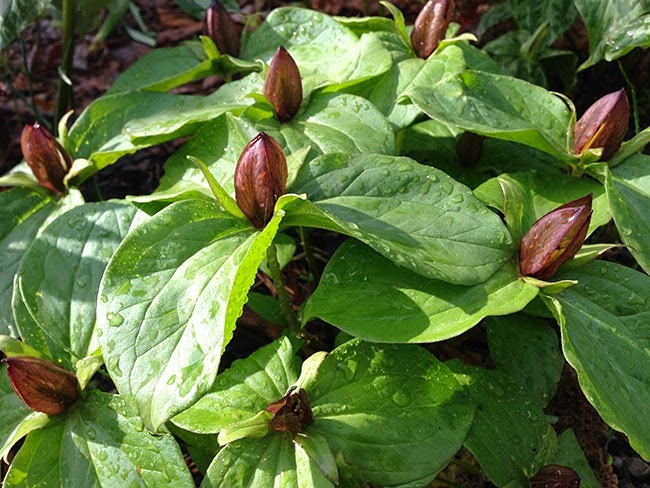 IT WAS GROWING IN THE GARDEN OF BEV AND BOB WALTERS. THE WALTERS'GARDEN FEATURED BOTH WATER AND THIS INCREDIBLE CREVICE GARDEN. 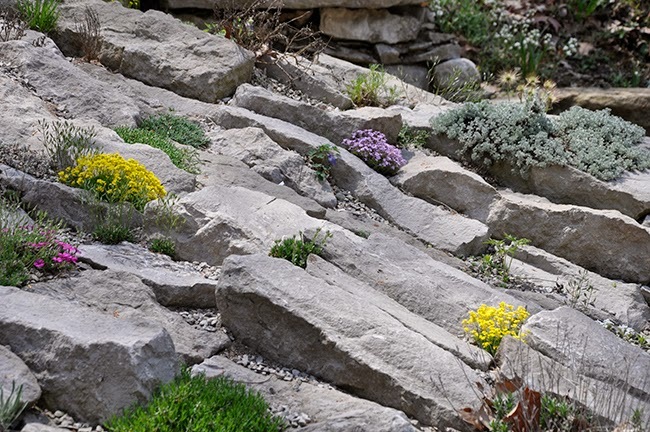 THE CURRENT TREND OF CREVICE GARDENING WENT TO AN ENTIRELY NEW LEVEL WIT THIS ONE IN THE GARDEN OF TONY AND SUSAN REZNICEK. NOT THAT ANY OF US EXPECTED ANYTHING LESS FROM TONY REZNICEK ( HE IS ALSO THE CURATOR AND ASST. DIRECTOR, UNIVERSITY OF MICHIGAN HERBARIUM. 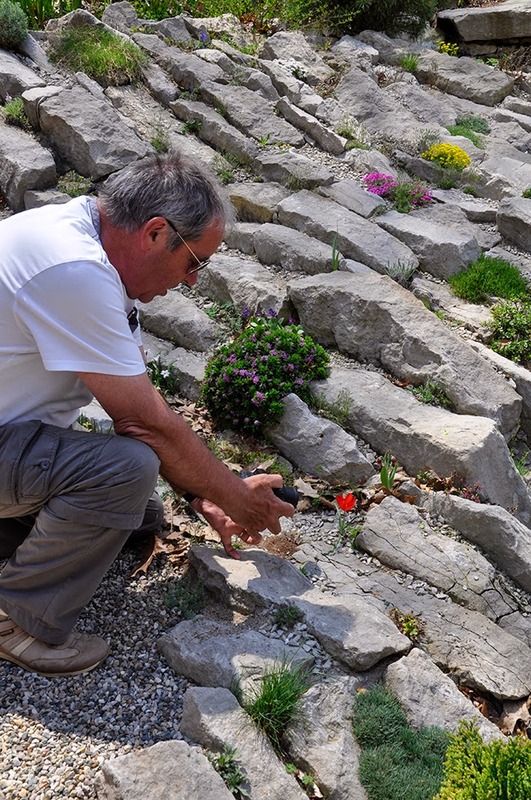 GUEST SPEAKER, NURSERYMAN GER VAN DEN BEUKEN FROM THE NETHERLANDS, TAKES A PORTRAIT OF A SPECIES TULIP IN TONY REZNECEK'S GARDEN. 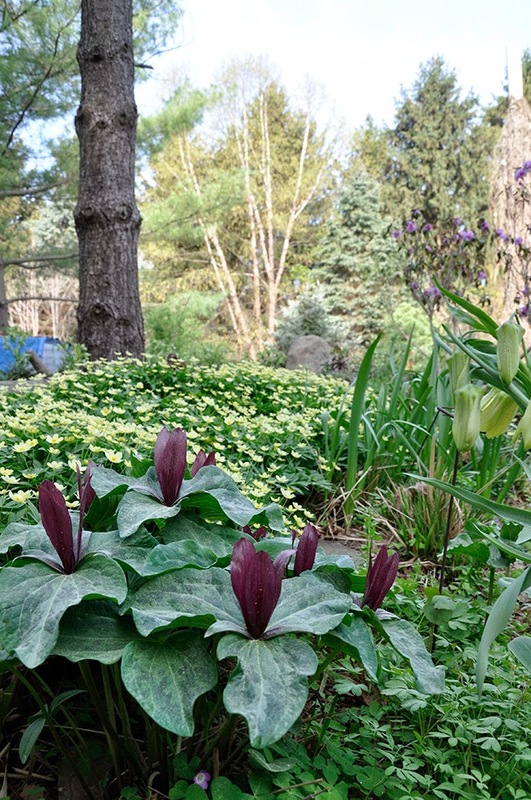 SUPERB TRILLIUMS WERE EVERYWHERE, IN ALL FO THE GARDENS. 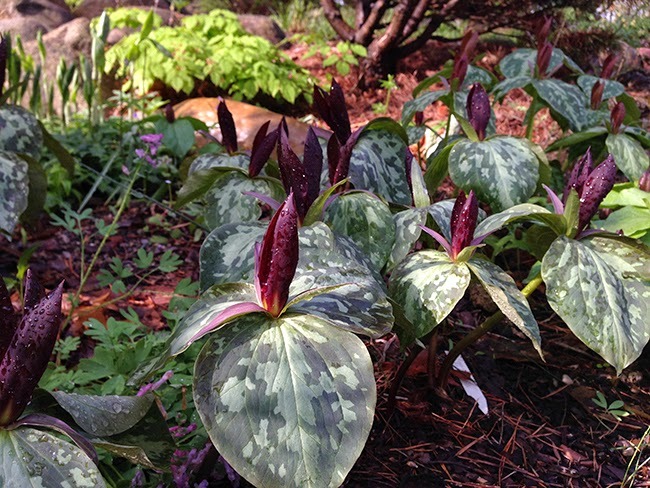 I NEED TO TRACK DOWN THIS TRILLIUM SPECIES, UNDERSTATED YET A NICE CLUMPER. 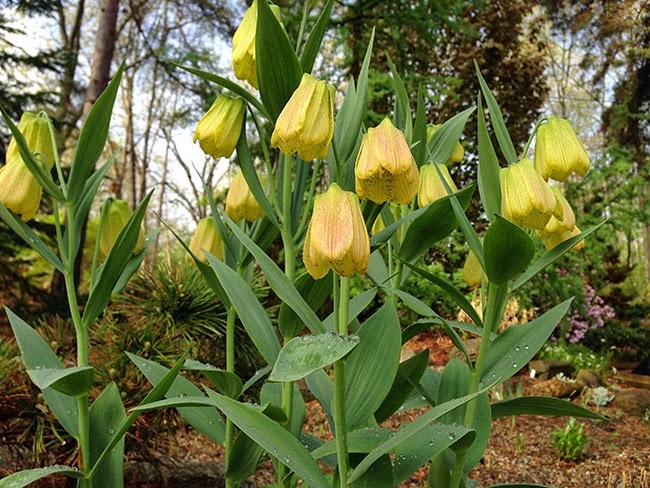 FRITILLARIA PALLIDIFLORA - IN DON LAFOND'S GARDEN - NOW YOU KNOW WHY FOLKS ORDER THIS ONE EARLY, AS IT ALWAYS SELLS OUT IN THE SPRING DUTCH BULB CATALOGS. 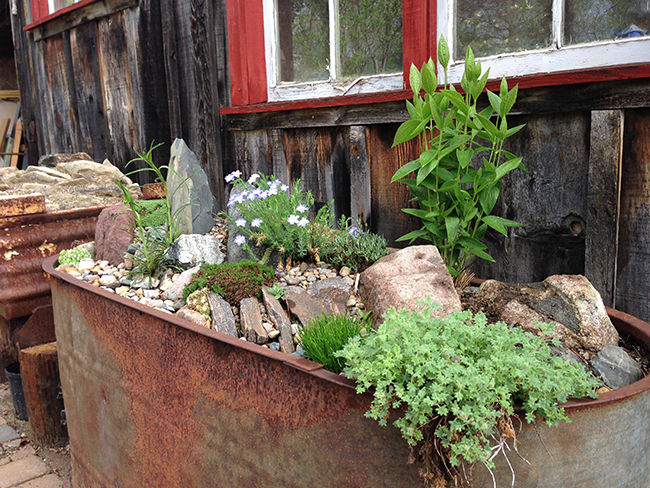 THIS METAL TROUGH IN DON LAFOND'S GARDEN DEMONSTRATES HOW GREAT DESIGN AND CREATIVITY CAN BE USED TO CREATE AUTHENTIC LOOKING TROUGHS EVEN WITHOUT HYPERTUFA. DON'S ENTIRE GARDEN REMINDED ME OF DISNEY IMAGINEERING PROJECTS - PERFECTLY CURATED AND CLEVER. MY FAVORITE PLANT OF ALL? 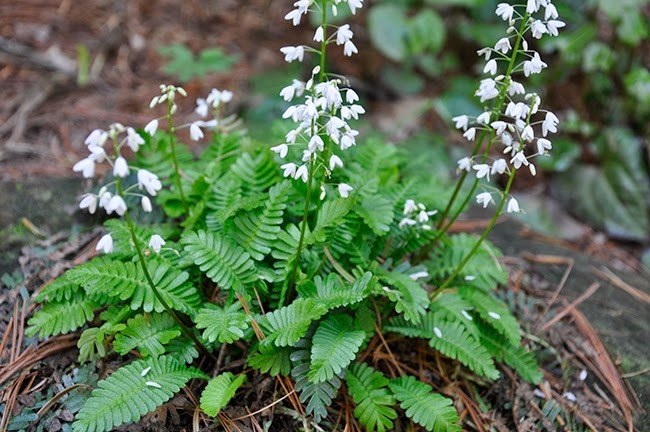 THIS SUPER RARE JAPANESE WOODLAND PLANT PTERIDOPHYLLUM RACEMOSUM SEEMS TO COMBINE THE LOOK OF A SMALL FERN WITH A CARDAMINE, BUT IT IS ACTUALLY IN THE POPPY FAMILY. 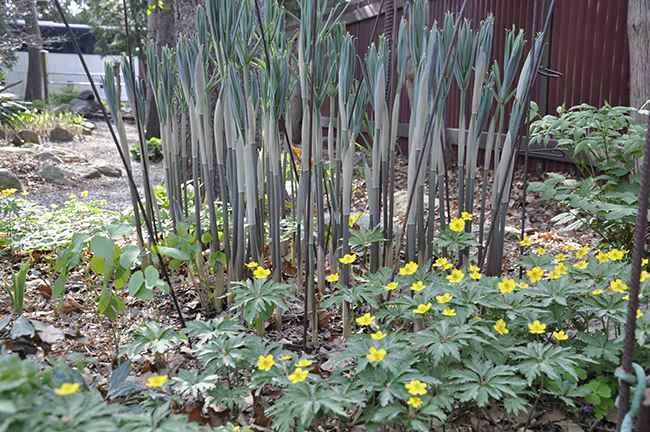 THIS SPECIMEN IN TONY REZNECEK'S GARDEN IS 8 YEARS OLD.